This board is used to generate note-on and note-off midi commands for a two octave organ pedal board. Vanes are attached to the end of each pedal. Pressing a pedal forces the vane to break the beam of a slotted opto-interrupter. There are five of these boards, in three different sizes, mounted at the back of a set of pedals. The board can be cut at either column of jumpers. 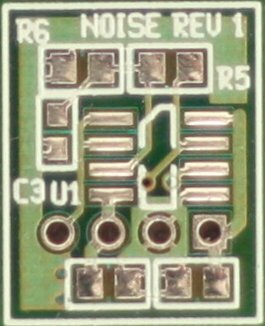 This white noise source is similar to the ARP 4022 noise module and the Minimoog noise generator. 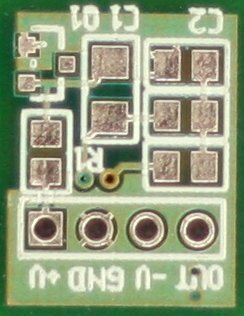 The noise module is 0.5 x 0.625 inches. The pinout of the header is +V,GND,-V,Output. This four-pole filter design is based on the Arp 4075 schematic. 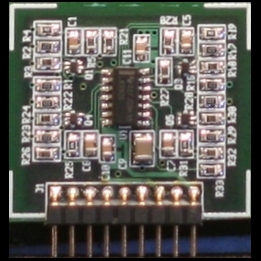 All the components are surface mount except for the interface header. All of these boards are custom products. Please contact iblocks for customization and purchasing options.